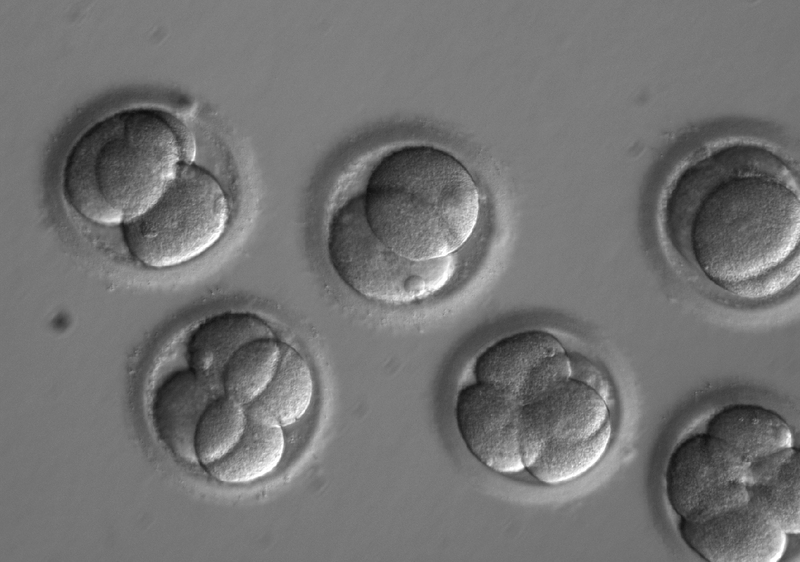 After much speculation last week, US scientists have published a study in which they used CRISPR to edit human embryos, removing a mutation linked to a heritable heart condition. The researchers say more than 10,000 heritable disorders controlled by a single gene have been identified, and CRISPR-Cas9 gene editing provides a potential method to correct disease-causing mutations in human embryos. In an accompanying editorial, Swedish researchers say the study is promising but more research will be needed to confirm the safety of the procedure. Note: there was speculative reporting in international media last week about this research; while that reporting is in the public domain, the journal publisher requests that the additional information presented in this article remain under strict embargo. This applies to the comments published on Scimex last week; while they are in the public domain, the commenters did not have access to the embargoed information in the research paper. We are aware that there has been speculative reporting in the media regarding this research without access to the research paper. Whilst the previous media coverage is in the public domain and can be reported, the information below, the paper itself and the announcement have been provided on an embargoed basis and therefore remain strictly under embargo. We would be grateful if any questions or concerns are addressed to the Nature press office before any action is taken. The press office can be contacted via the email address press@nature.com, which is monitored during UK and US working hours. We thank you for your consideration in this matter. A mutation implicated in a heritable heart condition has been corrected in preimplantation human embryos using the CRISPR–Cas9 genome editing technique, a Nature paper reports. The findings add to our understanding of the safety and efficacy of editing the DNA of the human germline (eggs, sperm or early embryos). However, many issues remain to be considered before clinical applications can be explored, including the reproducibility of these findings with other mutations. More than 10,000 heritable disorders controlled by a single gene have been identified, including hypertrophic cardiomyopathy (HCM), a disease of the heart muscle that affects about 1 person in 500, and that can cause sudden cardiac death and heart failure. Inheriting a single copy of a mutation in the MYBPC3 gene can result in HCM. Current treatments for HCM relieve the symptoms without addressing the genetic cause. One approach to prevent harmful mutations being transmitted to offspring is preimplantation genetic diagnosis (PGD), followed by the selection of embryos without the harmful mutation for transfer and use in an in vitro fertilization cycle. 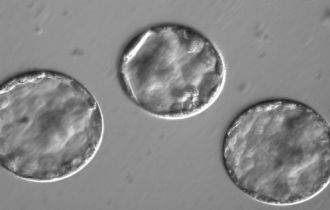 Recent developments in precise genome-editing techniques, such as CRISPR–Cas9, suggest that these techniques could potentially be used to correct disease-causing mutations in human embryos, thus increasing the number of embryos available for transfer. To evaluate the safety and efficacy of gene correction for heritable diseases in the human germline, Shoukhrat Mitalipov and colleagues focused on the MYBPC3 mutation implicated in HCM. They produced zygotes by fertilizing oocytes from healthy donors with sperm from a heterozygous male carrier of the MYBPC3 mutation, who carries one mutated copy and one normal copy of the gene. They used CRISPR–Cas9 to make a cut on the mutant gene sequence and monitored how human embryos repair these DNA breaks. In most cases, the breaks were repaired efficiently using the non-mutated copy of this gene from the unaffected donor as a mirror. As a result, about two-thirds of targeted embryos contained two mutation-free copies of theMYBPC3 gene. The authors also found a way to eliminate the mosaicism — in which embryos are composed of two or more genetically different types of cells. The results indicate that the approach is effective and the CRISPR–Cas9 targeting very accurate, providing some assurance regarding safety concerns; moreover, there was no evidence of off-target mutations. These findings suggest that this approach might potentially have applications for the correction of heritable mutations in human embryos in conjunction with PGD. Please note that information about ethical oversight, consent, participants and data availability is detailed in the methods section of the PDF. CRISPR is surprisingly easy to use, and what was stopping us from editing human embryos wasn’t really any technical limitation, it was more ethical barriers, concerns for safety, and lack of pressing medical need. This study by Ma et al. is more about testing the boundaries of our society vs any real technical advance. In fact, most of the “editing” observed was actually not what the researchers intended, for example the changes induced were not precisely controlled “editing”, as healthy DNA from the embryo actually guided the correction. So while technically a success, the researchers did not really do what they meant to do, and this highlights how things could go wrong if we rush into editing human embryos without really understanding how the process works. If, as a society, we were going to develop these approaches to genetically modify embryos to cleanse genetic mutations, there will inevitably be some mistakes and we need to consider that carefully. CRISPR genome editing will eventually revolutionize medicine, and in the near future could be particularly useful for therapies to repair inherited mutations such as those causing cystic fibrosis, sickle cell anemia, immune deficiencies, or common diseases including HIV or various cancers. On the other hand, talk of designer babies and genome editing for traits like intelligence or beauty is still very much science fiction, as we don’t really even know how to control these traits genetically. In most cases genetic mutations act in complicated ways, and can have different effects in different people. Basically recreational hacking of the human genome is still very much science fiction, so now is a good time for us as a society to discuss what we are OK with and what should be illegal. Acquired genetic diseases remain a significant cause of morbidity and mortality worldwide and provide significant rationale for in vitro fertilization and genetic testing of embryos. In recent years, the development of genome editing technologies such as CRISPR-Cas9 has provided a powerful means to modify DNA. While researchers use this technology routinely for experiment work, the application of this approach in human embryos is a significant advance with implications for manipulating the genome of future generations. The publication by Ma et al in Nature provides important new insights into the use of CRISPR-Cas9 for gene correction of disease-causing mutations. The findings reveal new mechanisms by which DNA repair occurs in the embryo and evidence for specificity of the genetic modification. These findings add to a growing field of studies showing the power of CRISPR-editing as a therapeutic for acquired and inherited diseases. The ethical challenges of defining the boundaries for genome editing in this field will require careful consideration as we increasingly gain the capacity to manipulate the human genome. This is a big leap forward and quite a remarkable study which has really addressed the issues previously seen with gene editing whereby off-target (unwanted) effects were always a by-product of the technology. Previously the problems with a genetic mistake were fixed, but not without also causing unwanted changes to other genes. This is a real breakthrough in that the researchers have shown they can repair their target gene within the embryo, which causes heart disease, without producing any off-target effects. It is obvious that CRISPR technology has the ability to alleviate the suffering that is caused with many genetic conditions, e.g. cystic fibrosis, however it could also allow for the manipulation of human traits such as height, eye colour etc., as well as many other applications such as crop and animal production. This technology currently remains in the testing stage and these latest developments raise further ethical questions for society to consider, much like IVF treatment was up for debate forty or fifty years ago. Following on from unsubstantiated reports of new research on editing the DNA of human embryos last week, Ma and colleagues have published evidence of genome editing in 'healthy' human embryos. Researchers from the US set out to correct a DNA-based error which causes genetic heart disease. Building on previous research from other groups, Ma and colleagues improved the success rates of the DNA editing (improved efficiency and fewer off target effects or mistakes) by changing the timing. From a purely research perspective, this is an exciting advancement, improving our understanding of how the embryo behaves during the first five days of life, and showing improved promise as a research tool. Clinically, the DNA editing incorporated small mistakes into the DNA, meaning these embryos would never be suitable to transfer to a patient. Genetically, understanding whether we can repair both copies of a faulty gene - the ultimate goal, and where this technology would likely be of use clinically - is no clearer. As a biologist, understanding if this technology is safe, and whether a healthy human baby can be born from a genetically-modified human embryo seems unanswerable right now. Seeing more experiments being performed in larger animal models (agricultural species like cow and pig) and in non-human primates will be essential, and should in my opinion, be a research priority, before more healthy human embryos are used for research purposes. But it’s not as simple as just being able to perform a biological technique successfully in a laboratory setting. Research needs to proceed only with extreme caution. Concurrent with the advances in the bench biology, multidisciplinary teams of biologists, IVF specialists, psychologists, bioethicists, social scientists, policy makers and advisors, and most importantly consumers (as well as many others) must work together to ensure that if one day scientists are positioned to perform the genome editing safely in humans, that globally it is considered useful, appropriate and desirable. Professor Merlin Crossley is a molecular biologist and Deputy Vice-Chancellor (Education) at the University of New South Wales. The report that US researchers have repaired a mutant gene in human embryos using CRISPR genome editing represents an interesting technical step that will trigger a lot of discussion. It shows that by using CRISPR at a very early stage one can probably avoid the issue of mosaicism (that is, of some but not all cells being corrected). They also show that off target effects are not detectable. Finally, the results are interesting because instead of using the ‘repair template’ provided by the researchers the cells seemed to use an existing intact copy of the gene to carry out the repair. It remains unclear whether embryos carrying two defective genes (i.e. with ‘homozygous mutations’) could as readily be corrected. My reading of the report in Nature is that an already existing strategy of simply testing embryos produced by artificial insemination, and selecting embryos for implantation that have inherited two intact copies of the gene in question, remains an alternative approach – i.e. so called ‘pre-implantation diagnosis’. Accordingly, for the foreseeable future human germline modification, if it occurs at all, will be extremely rare. It may be considered in cases where both parents are affected by a serious genetic disease and thus only capable of producing offspring carrying ‘homozygous’ mutations. But from this work we don’t know if that will even be possible. I doubt it will be used in any other situations, such as genetic enhancement, for the simple reason that the risks and benefits are not clearly defined. We do not yet know enough about the risk of off-target effects, nor do we generally know which genes would provide enhancements. The fact that the procedure can be done in the lab doesn’t mean that the very few potential parents who might benefit will move to rapidly adopting it. The process of modifying an embryo in a test-tube is one thing but successfully carrying that embryo to term is obviously a much more significant undertaking, and a mother, clinicians and researchers, would all have to be involved, having given considerable thought and consideration of the chance of success, the cost of failure and local legislation. Gene editing technologies such as CRISPR can be used to alter the genetic code in living organisms. They have been used by many groups with high efficiency in cells growing in dishes and in animal models of human diseases. For exploratory science, gene editing technologies have proven very powerful, giving great insights into biology and human disease. Understandably, there has been concern on where these technologies may be next applied as gene editing techniques have the capacity to alter human DNA sequences. Gene editing offers the possibility of correcting genetic disease causing mutations, so that parents known to carry a disease mutation may avoid passing the disease to their children. There are understandably polarising views on the ethics of such possibilities. Gene editing in human embryos was first done in China, and has now been done in the US for the first time, with the latest study published by Ma et al in Nature. The investigators tried new approaches in order to improve the efficiency of gene editing and to avoid the introduction of any unwanted sequence errors, and from these perspectives, the results are very impressive. The embryos were not permitted to develop very far and were never intended to be implanted. The study aimed to refine the technology and assess its feasibility for use in clinical medicine. The investigators sought to correct a genetic mutation known to cause inherited heart failure. The father carried one copy of the disease mutation and has a 50 per cent chance of passing it onto each of his children. The mother had two normal copies of the gene. What was different in this study was that the gene editing components were introduced at the same time as sperm, i.e. at the time of fertilization, and a particular timing of egg growth was chosen for injection, to try to optimise results. The two major technical concerns with gene editing in human embryos are the creation of mosaic embryos which have a mixture of edited and unedited copies of a gene, and the introduction of unintended mutations in the genome, known as off target effects. This new study thoroughly investigates these potential issues and remarkably the efficiency of gene editing was very high, there was effectively no mosaicism and no off target mutations were detected. Importantly, the study showed that mutation repair in embryos appears to preferentially occur using the mother’s gene copy rather than the introduced DNA template. The one embryo with mosaicism (out of 42 embryos) had all cells edited/repaired, but some cells had used the mother’s normal sequence and others had used the DNA template normal sequence. This would be avoided by changing the design of the template DNA. The study advances our understanding of gene editing technologies and again highlights the need for discussions on what situations gene editing will be used in in the future. The latest Nature publication by Ma et al. describing the correction of a mutation in human embryos by injection of CRISPR-Cas9 is a highly anticipated confirmation of the high efficiency of this genome editing technology, bringing it a step closer to applications in humans. The CRISPR system can be used in human embryos to correct an inherited mutation with a very high level of efficiency. The ability of CRISPR to generate 'unwanted' mutations in the human embryos (referred to as 'off-target' mutations) is close to nil, and the fidelity of CRISPR is astonishing. Indeed, the authors conducted one of the more thorough analyses of off-target mutations to date, using three types of genomic sequencing, and could not identify a single off-target mutation. Another concern when using CRISPR is the long lasting effects of the Cas9 protein that can induce more than one type of mutations in a developing organism (referred to as 'mosaicism'). Here, Ma and colleagues managed to drastically reduce this bias by precise and timely delivery of the CRISPR components to the embryos. Finally, one of the most interesting and new findings that came out of this experiment is the ability of the human embryos to exclusively use their 'normal' endogenous copy of a gene to correct the mutated copy, following CRISPR editing. To date, scientists have almost systematically provided an exogenous 'normal' copy of the gene as a template to be used by the cell to repair the faulty copy. There is no doubt these experiments, lead by Professor Shoukhrat Mitalipov at the Center for Embryonic Cell and Gene Therapy in Portland, Oregon will set a precedent in the race for embryonic gene therapy, and will spark worldwide reactions. Yet, one should be very careful not to extend such a proof of concept to any genetic disorder. Indeed, the set up in which the authors performed their experiments is limited to well-characterized 'late onset dominant' mutations where the mutated copy of a gene of interest could be detrimental if not properly managed. This type of disorder accounts only for a very small sub-set of genetic disorders, and preimplantation genetic diagnosis coupled with genetic counseling remain the only means to prevent transmission of most inherited disorders. The CRISPR/Cas9 gene-editing system is still a very new technology and most experts in the field would agree that we must be very cautious about using this technology to create lasting changes that are inherited by subsequent generations as this could have undesirable and unpredictable consequences. More studies are needed to fully evaluate the safety and limitations of gene editing technologies before their widespread clinical use. Although this recent study shows that gene editing to repair a defective gene in human embryos is possible, it is unlikely that this will supersede the existing proven embryo screening technologies in the near future. This study reports the use of gene editing to repair a disease-causing mutation in human fertilised eggs. They report that this gene editing is feasible and potentially safer than gene editing in other cell types as the egg is able to repair the cut DNA more efficiently. While this is a major breakthrough, this is still very much research and the technology has a long way to go to be both efficient and accurate. Indeed, while the research study itself was allowed, modifying human embryos for the purpose of making a person is not legal here or in most countries. It will be for society to consider whether editing a human genome such that that change can be inherited by the next generation is acceptable. The research in the US by Ma et al, using CRISPR in human embryos at the stage of fertilisation to edit out a gene associated with a significant form of heart disease, is an important advance in our understanding of genome editing. Injecting the genome editing components into the egg before fertilisation seemed to enable the genome editing to be targeted more precisely than in previous studies, and appeared to minimise the likelihood of genetic disorders in resulting embryos. Such improvements in genome editing processes are particularly significant, as these alterations would be passed on to any offspring of the resulting embryo. Also, minimising the chances of an embryo developing with the gene associated with this form of heart disease is likely to benefit those using pre-implantation genetic diagnosis (PGD) as part of assisted reproductive techniques. However, genome editing research with human gametes and embryos is still at an early stage. 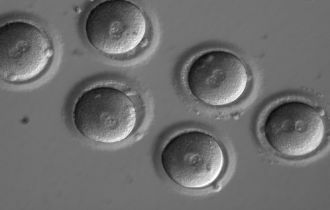 In editing out a gene associated with a significant heart disease in the resulting embryos, it is important to avoid the creation of other embryos which then have a different genetic disorder. For many decades we have been using technology to prevent transmission of inherited diseases. IVF clinics around the globe routinely screen for embryos that are free of genetic mutation where couples carry a risk of passing on a genetic condition to their children. The discovery by Ma and colleagues describes how it may be possible to correct the mutation in an IVF embryo - effectively rescuing the embryo which would otherwise be discarded. While their proof-of-principle paper describes how they have improved the efficiency of the technology used to correct the defect, more research is required to optimise the approach to ensure that the correction does not inadvertently cause further harm. Given existing methods employed by IVF clinics enable parents to have children free of genetic disease, the adoption of new technology to correct genetic defects in human embryos requires careful consideration. This is a promising beginning to what is going to have to be a prolonged investigation into the safety and efficacy of gene editing. It is a technique that offers a great deal in terms of treating devastating conditions, but there’s also considerable concern about potential risks. If it’s to be allowed here, there are also some legal hurdles to be overcome. In New Zealand at present, the legal status of this sort of research is somewhat in limbo. Human embryo research is only allowed on ‘non-viable’ embryos, but there are difficulties around determining precisely what that means. The UK and Australia both research on surplus embryos – those created during IVF treatment, but which have no prospect of ever being used to create a pregnancy. Proposals have been made to allow this in New Zealand, but for now, it couldn’t be done. In terms of using this technique for reproductive purposes, again the legal status isn’t exactly certain. The HART Act makes it illegal to ‘Implant into a human being a genetically modified gamete, human embryo’ - but there’s no definition within the Act of ‘genetically modified.’ Assuming it mirrors the definition in the HSNO Act, Parliament would need to make changes to the law before this technique could be used to create an embryo for reproductive purposes. gene editing in living humans, at least in New Zealand. 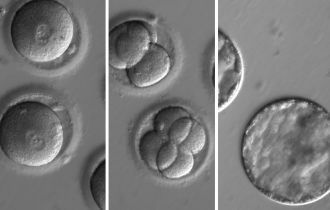 This sequence of images shows the development of embryos after co-injection of a gene-correcting enzyme and sperm from a donor with a genetic mutation known to cause hypertrophic cardiomyopathy. This image shows embryos after co-injection developing into blastocysts, which could someday be used in fertility clinics to help people trying to have children free of genetic disease. This image shows individual blastomeres within the early embryos two days after co-injection. As a result of initiating the repair process at the time of fertilization, a new study revealed that each new cell in the developing embryos was uniformly free of the disease-causing mutation. This image clearly shows the first sign of successful in vitro fertilization, after co-injection of a gene-correcting enzyme and sperm from a donor with a genetic mutation known to cause hypertrophic cardiomyopathy.